Opinion: Green tech metals for renewable energy and other smart technologies need to be sourced sustainably and responsibly. Here’s how. Climate change solutions — like solar energy, wind energy and electric vehicles — depend on rare earth elements. How we secure those elements matters. February 1, 2019 — The recent Intergovernmental Panel on Climate Change (IPCC) report on climate change argued that we must cut global emissions in half by 2030 in order to meet the goal of keeping global warming to 1.5 degrees Celsius as agreed to in Paris in 2015 at the Conference of the Parties to the United Nations Framework Convention on Climate Change (COP 21). In response to such dire predictions, the world is moving toward renewable and smart technologies at an accelerating pace. Climate solutions, like solar energy, wind energy and electric vehicles, depend on rare earth elements. These so-called “green tech metals” have unique magnetic and luminescent qualities that make them very difficult to substitute with other elements. In 2017 the World Bank launched its first major study on green tech metals. The authors argue that meeting the Paris Accord will result in skyrocketing demand for metals like cadmium, neodymium and indium. As countries transition to low-emissions economies, we need to make sure we source metals in an environmentally and socially sustainable manner. We can do so by committing to three practices: repatriating primary mining, recycling metals and repairing our technology rather than replacing it. This is not an impossible task and we can find inspiration from projects in Europe and Japan. Nearly all green tech metals in the world today come from China, where they are mined under dangerous conditions to both people and ecosystems. Hong Kong-based watchdog nonprofit China Water Risk reports that mining one ton of rare earth metals in China can produce 60,000 cubic meters (2.1 million cubic feet) of waste gas, containing dust, hydrofluoric and sulfuric acid; 200 cubic meters (7,000 cubic feet) of acid-containing sewage water; and over one ton of radioactive waste. China has also proven to be an unstable trade partner. Geopolitical tensions arose in 2010 when the country drastically cut 40 percent of global exports of rare earths in the midst of a territorial dispute with Japan. This shock led many industrialized nations, including Japan and the U.S., to look to new supplies and trade alliances. Repatriating green tech mining to industrialized countries, where strong regulations can guide responsible extraction, may be part of the answer. In 2017, President Trump signed Executive Order 13817 to boost U.S. domestic supplies of critical metals. 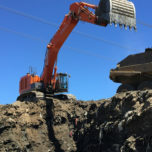 Similarly, French President Emmanuel Macron has committed to resurrecting France’s mining industry to exploit rare earths in his country’s subsoil. The U.S. Department of Interior lists 35 minerals they deem “critical” to the U.S. economy and national security. Domestic deposits for many of these metals exist in Alaska, California, New Mexico, Colorado and Utah, among other states. One big challenge is that not every community wants a mine in their backyard. 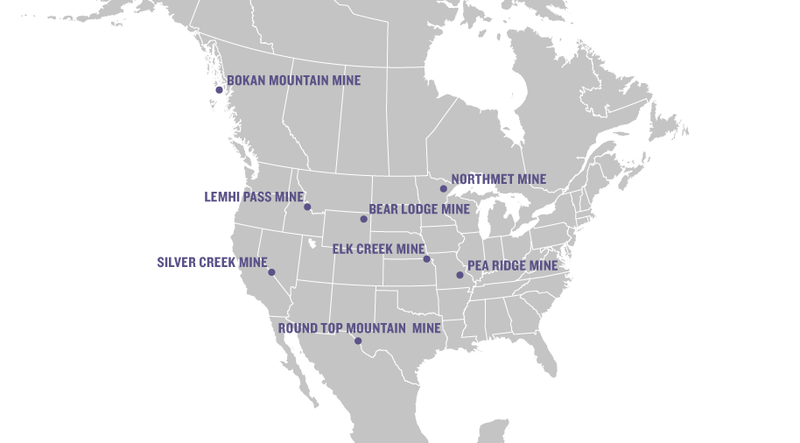 My research lab examined eight cases of new mines being developed in the U.S. The map and table below — taken from a larger research initiative I lead — provide a snapshot of levels of public support for these projects. Public support for mines various greatly by community. Click map and chart to enlarge. 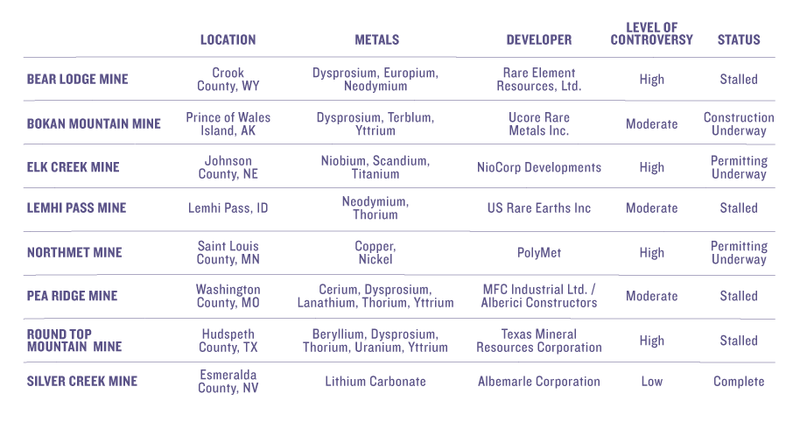 Among these examples, Ucore’s Bokan mine near Prince of Wales Island, Alaska is the most likely to actually produce metals soon. Supported by a US$145 million finance package from the state of Alaska, this underground mine would extract 5.3 million metric tons (5.8 million tons) of dysprosium, terbium and yttrium from the largest known rare earth deposit in the U.S. over its projected 10- to 15-year lifespan. In contrast, projects in Texas, Idaho and Wyoming have stalled because they lack the immense capital investment needed to launch and face volatile global commodity markets. Opening new mines and processing plants in the U.S. is likely a decade or more away. Yet, less than 1 percent of the rare earth elements we use are recycled. It is time to turn more aggressively toward recycling metals already above ground to solve our metals crisis. The United Nation’s Environment Programme found that recycling rates are already high for precious metals like palladium and platinum. But recycling facilities for rare earth elements such as tellurium and neodymium are virtually nonexistent. We need to develop recycling infrastructures now for these newcomer metals. As journalist Nate Berg wrote recently in Ensia, experts say state and federal laws must require manufacturers to r­­ecycle and recover green tech metals. 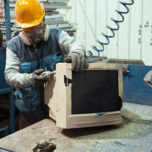 In 2002, the EU passed the WEEE (waste electric and electronic equipment) directive, which requires manufacturers to take back and recycle large and small home appliances, computers, medical equipment and telecommunications products. The EU reports results by nation and equipment category. In 2015, the EU 28 member states recovered an average of 87.5 percent of IT waste and 88.6 percent consumer electronics, although the EU target was set at 65 percent. 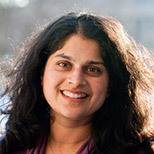 A set of more aggressive targets were launched in 2019. Similar laws have existed in Japan since 1997. In comparison, the U.S. lacks any comparable federal law. The wind energy sector presents a unique opportunity in both the U.S. and Europe to ramp up rare-earth recycling. Wind turbines have a lifespan of about twenty-five years. As some of the first projects in the U.S. and Europe reach their end of life, recycling turbines and gear boxes is a tremendous opportunity to harvest metal. Joe Rand, scientific engineering associate at Lawrence Berkeley National Laboratory, told me that “more than 6,000 wind turbines have already been decommissioned and removed in the United States.” Wind turbines and gear boxes may end up in landfills if we do not create a system for recycling and repurposing old parts. Turbine blades are a bigger challenge. Most blades are made of glass or carbon fiber composites which are difficult to recycle. One study anticipates 50,000 metric tons (55,000 tons) of blade waste by 2020. In the Netherlands, blades are being reborn as playground equipment and plaza seating. Per a story in Wind Power Engineering and Development, Germany has “the world’s only industrial-scale factory for reprocessing wind turbine blades.” This facility cuts, shreds and hammers blades into fragments that are used in cement making. The third solution, focused on consumers and product producers, is to repair our electronic gadgets rather than constantly buying new ones. Here, we can also draw lessons from Japan and the EU in creating a culture of repair rather than replace. In post-WWII Japan, the ancient concept of mottainai, or “waste nothing,” was mobilized to address resource scarcity when every household was warned not to waste even a grain of rice. In an email interview, Williams College historian Eiko Maruko Siniawer, shared with me that mottanai has turned into a millennial political movement that aims to build “an energy conscious and waste conscious” civilization in Japan that challenges a throw-away culture. Mottanai can be seen in Japanese repair cafés where volunteers fix broken electronics brought in by local citizens. But this repair movement is most lively in the EU, where more than 1,500 cafes are part of a global fix it network. Visiting or working in a repair café can be a political act that challenges consumer waste and corporate planned obsolescence. The EU also leads repair policy. In January 2019, EU member states enacted new “right to repair” legislation for home appliances. This was on the heels of active citizen protests. A nascent repair movement is also emerging in the U.S. but needs similar policy support. California became the 18th state in the U.S. to introduce “right to repair” legislation that would require manufacturers, like Apple and Samsung, to supply parts and repair manuals to consumers. Manufacturers are putting up a tenacious fight claiming that repairing electronics poses dangers to users. In contrast, independent repair companies, and even farmers who don’t want to be beholden to John Deere to fix their machinery, are fronting a social challenge that could make a dent in both our carbon emissions and demand for scarce metals. In a world increasingly powered by renewable energy and clean technologies, it’s critical that we source green tech metals sustainably and responsibly globally. If we don’t, we risk solving climate change by creating a host of new environmental problems. The answer lies in transitioning our post-carbon economy toward robust recycling, reuse and repair. Why aren’t we mining landfills for valuable materials like metals and soil? We know the wrong way to deal with e-waste. But what should we do instead?